1) The donation screen, on which we ask you to type in your name and other information, in addition to the amount of your donation. 2) The screen on which you ask to “stay Flora-informed,” that is, to subscribe to our occasional e-newsletter, Florascope. The only organizations with which we might ever share contact information would be two of our key designated partners, the Virginia Department of Conservation and Recreation and the Virginia Native Plant Society, whose work overlaps strongly with ours. We are more likely, however, to ask them whether we ourselves might send you their information. If we were compelled by law to disclose information, we would comply, but we do not collect any financial information from our supporters. PayPal obtains any payment information from a donor, and we do not sell anything ourselves. If you subscribe to Florascope, you may unsubscribe whenever you wish. You will find an unsubscribe link at the bottom of each issue. 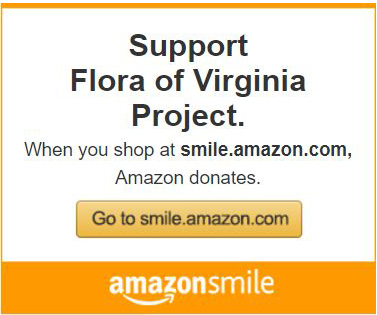 The full, legal name of the Flora of Virginia Project is the Foundation of the Flora of Virginia Project Inc. We are a 501(c)(3) corporation and a public charity. Our FEI number is 54-2053212. Our address is P.O. Box 512, Richmond, Va. 23218.